On behalf of the people of Northwestern Province, we as the Provincial Executive Committee of MMD in Northwestern Province wish to show our solidarity in its entirety to our Party President of our great Party MMD Dr. Nevers Sekwila Mumba for his steadfast and visionary leadership he has started and continued to steer in the Party. With Dr Mumba, Zambians are guaranteed to earn back their lost hope once MMD is bestowed with the responsibility of taking care of the welfare of the country in the foreseeable future elections. We wish to re-affirm our stance to rally behind Dr Mumba all the way. We equally wish to thank the President and articulate NEC members for cracking the whip on Major Richard Kachingwe to ensure that discipline is upheld regardless of who one was in the party. The behavior of Major Kachingwe was highly irresponsible and uncouth. As a matter of fact, Kachingwe sold MMD prior to 2011 general elections and his expulsion is good riddance for rebranding of MMD. As a party that is coming from a huge defeat orchestrated by mischievous people like Kachingwe, discipline is paramount. Of course there could be those that feel they are more MMD than others but as long as they do not show leadership by merely being arrogant and going against the party ethos, they would be flashed out because MMD is bigger than any person and it is an all-inclusive party that does not condone indiscipline. MMD is the only Party that no individual can claim ownership because it is founded on true tenets of democracy. It is wishful thinking for those agitating the removal of the Party President to think they will succeed. Dr. Mumba is the only capable leader to lead MMD. Writings are on the wall for all to see including myopic Namugala that Nevers is the man of the moment. It is common knowledge that no one, with due respect, among NEC members would have withstood what Dr Mumba is going through at the expense of MMD. 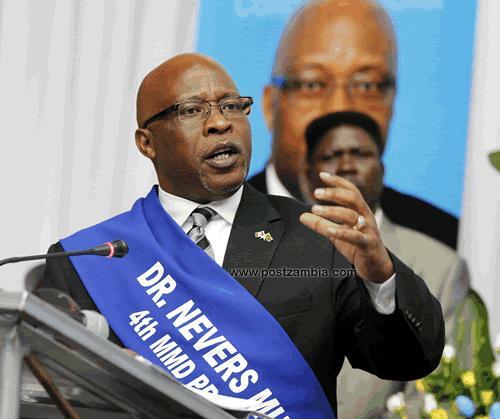 It is equally common knowledge that MMD would have gone into extinction by now had any other person assumed Party Presidency apart from Dr Nevers Mumba. It is a common fact that a few of those that did not support the candidacy of Dr Mumba like Namugala are the only ones that want to fun confusion. But we, as people that ushered Dr Mumba into office, shall not allow such unbecoming behavior from the likes of Kachingwe, Namugala and their unsung masters to bring down MMD all because of their selfish motives. We also want to remind them that posterity will judge them harshly for their wanton behavior. We want them to know that all their schemes and machinations shall not succeed but only strengthen MMD instead. Namugala is a spent force. We are all aware that she was handpicked by Kachingwe to replace Sylvia Masebo as National Chairperson for Women Affairs that’s why she has lamentably failed to steer the women movement in the Party because she is a bad mother. Her position entails being a mother of all MMD officials and cadres. Now if she were a good mother, why have she out rightly taken sides with Kachingwe and other disgruntled elements other than calling all perceived factions to iron out issues amicably. She is really a bad mother who must be divorced (expelled) immediately. We, in the same vein, wish to caution Catherine Namugala that her time of reckoning is nearing and she must sober herself and be in tune with reality which seems to have eluded her. Namugala is a shameless person who lacks reasoning. Her arrogance will take her nowhere. We all know that she is just frustrated because Hon Felix Mutati did not win. Namugala is on record of having said, in May 2012, that she would only accept Mutati or Musokotwane to be MMD President for obvious reasons and we challenge her to deny it. This only shows that Namugala is so immature and myopic that she cannot even differentiate her character from her image in the mirror. It’s unthinkable and uncultured to ridicule or mock someone who has legitimately and overwhelmingly been elected as Party President in MMD. Any grievance or complaint has channels. We condemn Namugala and her sponsor’s conduct. We are live to the fact that she is a disgruntled character who is so unrealistic. Moreover she is a hired gun. We recommend for her immediate expulsion from MMD. On the other hand, we also wish to express our resolve to support fully the Acting National Secretary Hon. Kapembwa Simbao and urge him to soldier on for the benefit of MMD. We are surprised and disappointed that certain individuals to the stature of Catherine Namugala can choose to undermine Hon Simbao’s authority insinuating that only a NEC member or the Deputy National Secretary (Nyangu) can replace Kachingwe. Well, we want to correct the ignorance of Catherine Namugala and persuade her to read and understand our Party constitution. We want to remind Namugala that Article 9 (d) of our constitution stipulates that “a member of the Party has a right to elect or to be elected or APPOINTED into the leadership of any of the Party organs and positions of authority. So Hon Simbao’s appointment is backed by the constitution. It is actually Namugala and her minions that are ignorant and off side. It is a pity that despite Namugala joining MMD in 2001 she is still ignorant about the MMD constitution. We want to remind her that Comrade Vernon Mwaanga was appointed as National Secretary by Dr Chiluba when he was just a card carrying member of MMD and after Mr Michael Chilufya Sata resigned to form PF. Finally, we want to urge NEC to expel all members that are feuding confusion including Namugala because they are not genuine members. Let them hang themselves if they cannot come to terms with reality that Dr Nevers Sekwila Mumba is the man of the moment for MMD.